Three key drivers are transforming legal from an internal law firm to a function that drives value for the business. See what the future may have in store. Over the past 10 years, unprecedented disruptions—including the deregulation of the practice of law and advancements in technology—have been changing the face of the legal sector. Rigid silos are being replaced by more fluid structures. And in-house lawyers are becoming business partners, embedded and able to work across units and specializations. So what will corporate legal look like over the next 10 years? Consider the following potential scenarios in technology, service delivery, and operations. Like other corporate functions, such as human resources and finance, legal departments are already experiencing technology disruption. 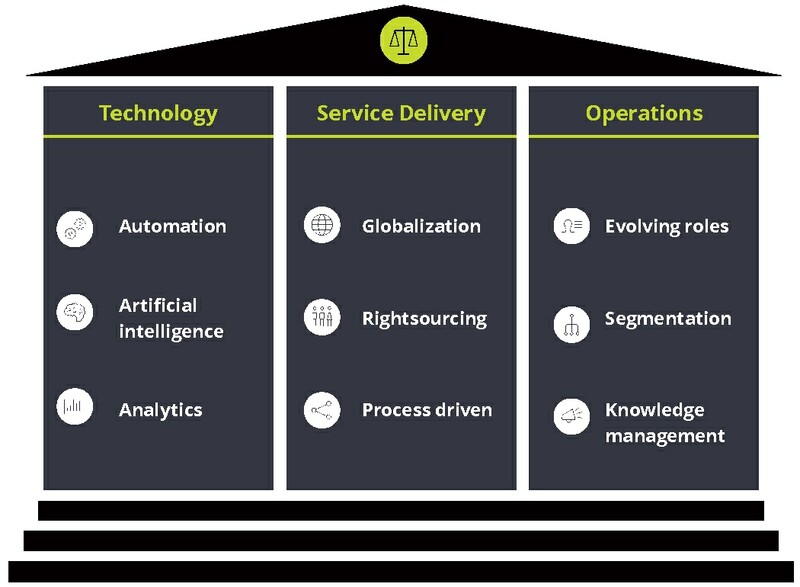 The “three A’s” listed below are just a few technology disrupters that will likely shape the legal department of the future. Automation continues to be a major driver that’s affecting workflow. In addition to automating routine processes and digitizing documentations in such areas as e-billing, technology will allow legal departments to perform more advanced tasks. Artificial intelligence will be part of the next wave of transformation and disruption. This isn’t to say that we’ll have robots replacing humans in the legal department. But machine learning can be applied to legal tasks. Analytics has already made its presence known in the area of managing legal expenditures. As sensing technologies become more commonplace, companies may look to their legal departments to predict areas of exposure and risk—in advance of an issue occurring. The legal department of the future will also look different—perhaps drastically so—with respect to service delivery. We’re seeing evolutions and revolutions in globalization, sourcing/shared services, and internal legal professional needs. And we expect to see more in the future. Globalization. In close coordination with the evolutions in technology, we’re already seeing the blurring of global borders in legal departments. Although local in-country knowledge is required for particular legal matters, legal services could be delivered effectively across the globe (where organizations are authorized by license, law, and regulation to do so). Sourcing. We’ve already seen shifts to lower-cost providers for legal process outsourcing, as well as the strategic use of outside counsel law firms for more specialized legal matters. But there’s also been a move to insource more legal work where possible. Furthermore, legal departments may look to more lower-cost providers onshore and explore opportunities to centralize their internal functions in shared service centers/centers of excellence. The concept of crowdsourcing has begun to take hold in legal areas as well. Internal service delivery. Law schools are already focusing on training lawyers in areas beyond traditional law, such as business, process, and program management. Law departments are also beginning to focus more on productivity. But legal provides a unique spin on productivity, as it still has the task of protecting and defending the company from risk and liability. Perhaps the most transformative change will be increased reliance on legal operations. This change could include the evolving role of legal operations professionals, further segmentation to serve the business needs, and the increased role of knowledge management in the legal department. Legal operations professionals. We’re seeing more legal operations professionals than ever before in corporate legal departments. Beyond the organization itself, there’s a growing focus on the overall legal sector as it relates to legal operations. Segmentation. With the continuing evolution of legal operations professionals, the very face of legal operations within the legal department itself is likely to further segment and specialize. As a result, the new wave of legal operations professionals should be well-positioned to help legal better understand the business and to help the business better understand legal. This role should also evolve to provide legal with an opportunity to become a more effective and well-received corporate citizen. Knowledge management. As knowledge management within the legal operations community continues to evolve, it should enhance legal operations both within the company and throughout the entire legal sector. There are lessons learned and opportunities to share that can be gained from other corporate functions and applied to legal. And there may also be plenty to learn from sharing leading practices with other companies. Legal departments can determine their destinies and decide if and how they choose to embrace innovations in technology, new service delivery models, and increased operational and cost efficiencies. No matter what future a legal department envisions for itself, it will need to start forming a strategy today for how to get there. Download, “The legal department of the future: How disruptive trends are creating a new business model for in-house legal” to read the full report. Previous articleUBERIZAÇÃO DA ADVOCACIA? Robôs inteligentes vão mesmo substituir Advogados?